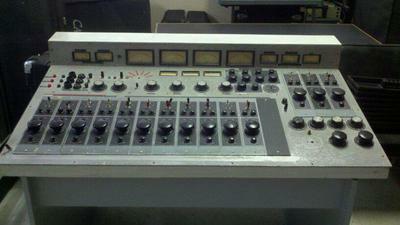 This is a picture of the recording console from American Sound Studios, Memphis Tennessee. It featured Universal Audio 610 modules, and was used between 1967 and 1970 at the studio. Over 122 charting singles and 40+ gold records were cut using this desk. It is still in existence and owned by producer Chips Moman. Join in and write your own page! It's easy to do. How? Simply click here to return to Recording and Film Consoles.